Snack time in the play room. What you don't see: Stella waiting in the wings for clean up. My life is over. She looks at me all proud. I put the stool on the counter, which naturally caused a two year old melt down. Both girls are climbing everywhere! The couch, beds, and top of the stairs are the places to be. But, they've also both learned to successfully get off beds and couches and go down the stairs correctly! Such a big day around here. But, I haven't waited to see if a successful counter dismount could be achieved. 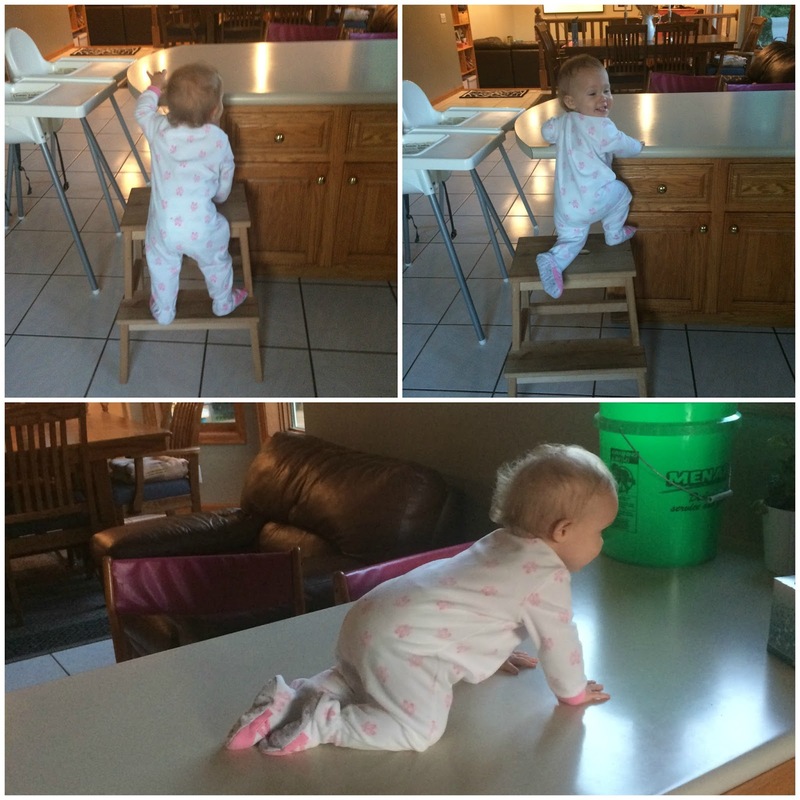 In addition to climbing on things, climbing into things is monumentally important around here too. And, yes, Jacqueline is in Christmas jammies. At any given meal Wade either needs to feed babies or needs me to feed him, there is never a meal without this struggle. But, he's been eating more...so, I oblige. That's pretty much life with a toddler, alway obliging. We got new lightbulbs in our living room and kitchen and it is the best (adulthood at it's lamest!). Husband's brother and his wife were here when we put them up and they agreed that this place has never been brighter! We've been joking that as the lights slowly went out we were saving money on electricity, but when more than 50% of the lights were out, it was just too pathetic. So, we bit the bullet and bought all new ones, and these will cost us about a dollar a year. Bring on winter. Bring on daylight savings. We're ready. And, for reals, this whole paragraph just proves, adulthood at it's lamest. Jac loves trying to drink from the faucet. Both girls love water and go crazy with envy when I'm rinsing the other post meals. The real injustice is when I put one girl in the sink first - how could I dare to not put them in at the exact same moment? I have some nerve. When I rinse Jac's hands and face she tries her hardest to swing the rest of her into the sink for a bath. Wade just finished drinking some milk and said, "I'm done with my nilk. You put it away now." SO bossy. Another thing to oblige on, haha. He's also been unintentionally tattling on Husband all day, he keeps telling me that, "I bonk my head with Daddy." Oh, and he's gotten into the habit of wiping his boogers on stuff. That's a cool new development. We've almost got the dog fence all the way in. It says that it should take a few hours, so in true Wright fashion, it only took us a month. Speaking of taking forever house problems, we've still got water damage in the basement. I ripped up about 8 feet of flooring so more damage won't continue. Now we've got some black mold on a small section of dry wall that we need to remove. Luckily it's in the basement, but it's in my mind and freaking me out! Between that and cleaning out the food storage closet, I'm a hypochondriatic mess. And then I look stuff up online and that's obviously super helpful. It's definitely fall around here, which I'm loving. Early fall is my favorite time of year. It smells wonderful and crisp outside. How does crisp have a scent? Extra blankets on the bed. Long pants, sweaters, and boots. It's that great time between mom shorts and parka's. I love fall. Except for the little socks that now clutter my entire house.